Hi Dave, The Croxton Hall post has quite intrigued me. I managed to find a map from 1898 and overlaid it on Google Earth. You can see the Hall was on the flat area behind the trees. I thought you might like to see this. Many thanks to John for putting this image together. 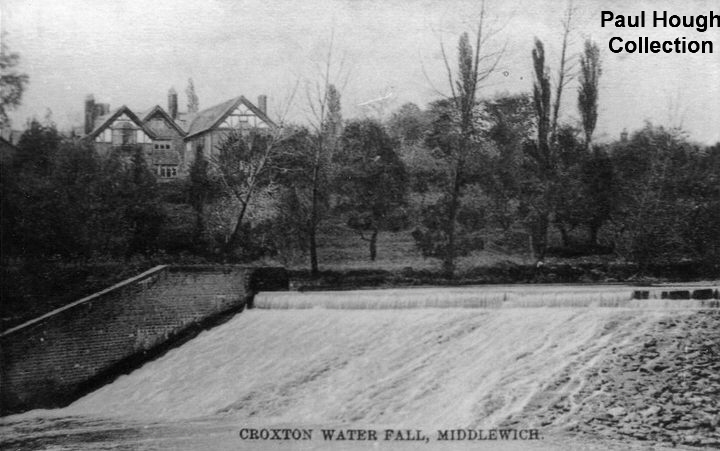 We've marked the position of Croxton Weir (or 'Croxton Water Fall') with an X. The Old Hall (if that is the building shown in the photograph), while not as far away from the river as the present farm, still looks a little too distant. This, of course, may be the 'foreshortening' effect we keep mentioning, caused by the type of lens used by the cameraman. John's diagram also shows the course of the mill race running down from the River Dane and under Croxton Lane to serve the Flint Mill which stood where the river and the Trent & Mersey Canal cross at Croxton Aqueduct. Note that Jim's picture shows part of the retaining wall on the opposite bank of the river. The problem is that it doesn't look like the wall in the original photograph, possibly due to subsequent re-building. In recent photographs, and indeed when glimpsed in real-life from the Croxton Lane bridge, the 'water fall' does not appear as deep as it does in the old photo. 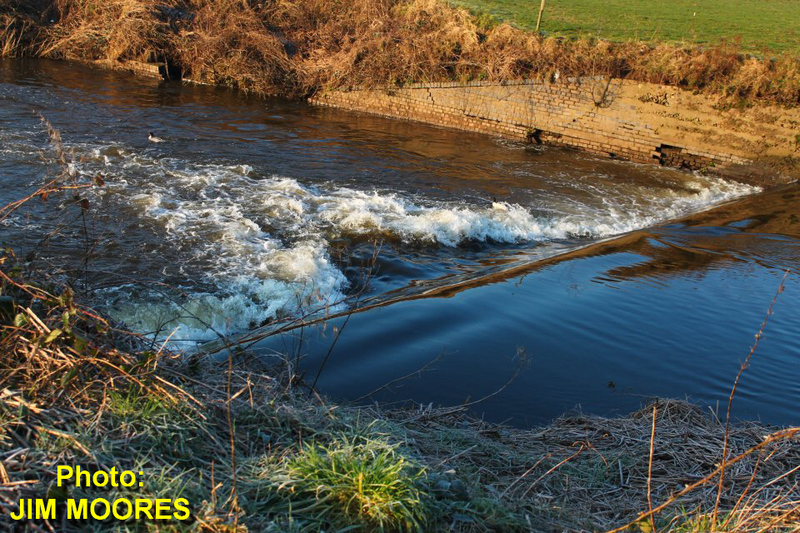 In this case we can't blame any differences in perspective: that 'Water Fall' has physically changed in the intervening years, and the water level in the lower part of the river appears to be much higher than it used to be. Is that sloping part of the weir, which probably inspired someone to call it a 'water fall' in the first place, still there under the water?. Now and Then: Can this really be the same place?